Co -author of the NHS Reinstatement Bill (with Peter Roderick) Professor Allyson Pollock, Dr Colin Hutchinson, Professor Sue Richards and Dr Graham Winyard, have written to the Secretary of State for Health, Jeremy Hunt. They have given him notice of their intention to seek a judicial review to stop NHS England from introducing new commercial, non-NHS bodies to run health and social services without proper public consultation and without full Parliamentary scrutiny. 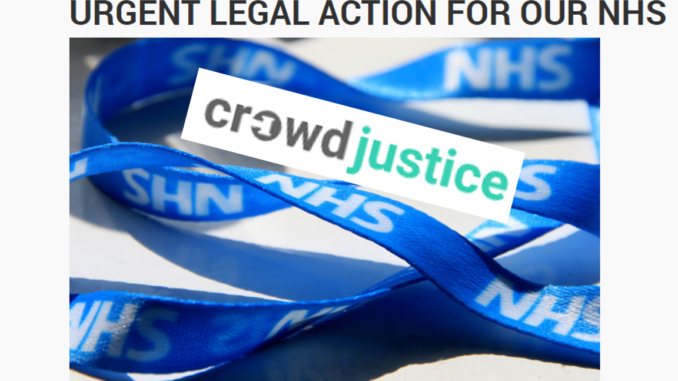 They have been working with Harrison Grant Solicitors and Nigel Pleming QC to argue that introducing new commercial, non-NHS bodies (ACOs) to run health and social care services without proper public consultation and without full Parliamentary scrutiny would be unlawful. This is a critical time in the move to the privatisation and americanisation of the NHS in England. It’s going to be a big fight and we need everybody to help. It will be expensive so, please consider donating towards the cost of the judicial review when the crowd justice site goes live Friday November 3 at 8am. It is critical that we reach our funding targets for the case to proceed. ACOs are one of the main mechanisms for implementing the policies Professor Stephen Hawking criticised last August. See this Guardian article, or our post on Hunt vs Hawking . This is a crucial moment in these further moves to embed privatisation in geographical structures and further weaken the NHS in England. This is a tough battle we have to support – they will need all the financial help they can get, alongside the political support of campaigners. What is the best way of waking the public up to this? Could Keep Our NHS public use donations to a TV campaign highlighting the issues where public money is going to private business and not for health service staff, medicine, treatment or equipment. All people see is failure when those in the service are stretched to breaking point. Keep the NHS public! !